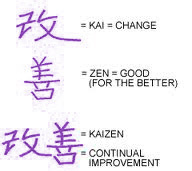 Kaizen is a Japanese management term, it refers to the continuous change for the better. It is a management approach that can be applied to many walks of life. Here I am going to suggest that this is a vital part of any Pay Per Click managers approach to PPC. Making continuous, well tested improvements to each element of the account will over time time tune your account, improve performance and aid managed expansion. PPC campaigns are not set and forget, they require regular monitoring and adjustments known as optimisation, so the campaigns are constantly evolving. If this is done based on tested logic this should drive the account in a positive direction. In order to truly optimise a campaign there should be regular testing of the different variables, this may include adcopy testing, positions, new keywords, negative keywords, different ad formats, campaign daily budget distribution, the list of variables in adwords goes on for quite a while! These tests and trials will enforce or call to question hypotheses and assumptions that stakeholders have and will help the drive more informed decisions as well as highlighting opportunities. There are usually improvements that can be found and new areas to explore to gain account performance and business insight. With time there will be fewer and fewer improvements and they will be harder to find, but they are there if you look hard enough and use the data to inform the changes made. Adcopy testing, by running multiple creatives on the same keywords the manager can determine which USPs drive the best performance, the advertiser can then incorporate this into future adcopy (and leave out what does not work). landing page / deep link strategy – By testing more than one landing page the advertiser can see what is most likely to lead to a conversion ( or lead to a higher value conversion). An example of this might be when bidding on a term for Train sets, would users be more likely to convert when they land on the Train Sets page or would they be more likely to convert if a specific PPC page is built using PPC landing page best practices? Keyword selection – search queries are constantly evolving, Google suggests they find 20% of search queries in any given month are new. Therefore if the keyword list you use is not evolving with search behaviour you may miss opportunities – expand too rapidly and you may expose yourself to a lot of risk (in terms of cost) while taking smaller, gradual but constant expansion will allow for closer management of these keywords. The same applies for negative keywords. Bids and positions – The keyword bid is a tricky one, this is because PPC is an auction, so it can vary depending largely on the competitors in that space, position and element called quality score. All accounts have to start form somewhere, an important part of the account set up is testing assumptions and building relevant data to drive insights. Based on these insights the accounts can be optimised on an ongoing basis, and with time will become highly optimised and bring the terms in the account closer to the Yield curve. While there are times making large changes will be necessary, such as restructuring campaigns or making changes to make the account more manageable, these large changes should be kept to a minimum while making small, well tested changes should be a regular occurrence!